© 2011 Kim Buchheit. 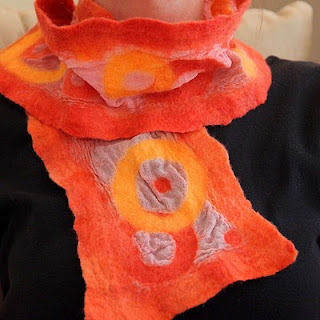 Nuno-felt scarf. I made some prefelts the other day and cut out several circles to include in this lively design. I used only kool-aid dyed merino wool and silk in the piece. The kool-aid bled a bit during the hot water stages (meaning the dye was not completely "colorfast") — the bleeding came mostly from the silk scarf, I think. However, by the time I did the final warm-water vinegar rinse, the water was running clear. Regarding the prefelts: I loved working with the prefelt cutouts and am surprised how well the cut pieces retained their shape during the felting process! © 2011 Kim Buchheit. Nuno-felted scarves. 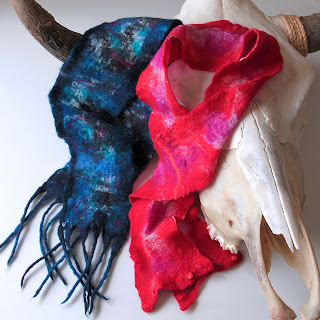 In preparation for a nuno-felting workshop that I'll be co-instructing this fall through the Grand Canyon Field Institute, I made some drapey wool scarves over the weekend. I love the fringe on the blue one, and the lightweight red one is much more vibrant than comes across in the photo; Canon seems to have trouble capturing reds. 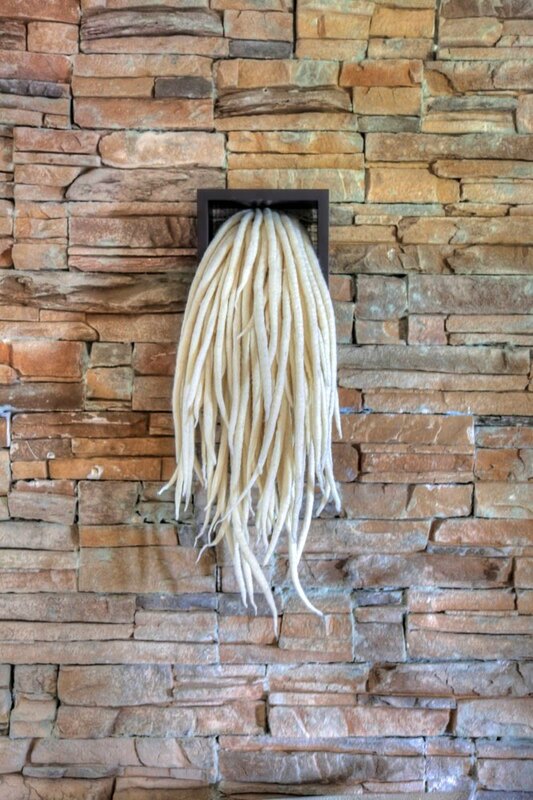 If you're interested in learning how to nuno felt, consider joining me and my fiber friend Jen Marshall, for a fun 2-day workshop at the Grand Canyon. All supplies included in the cost of the class, and the location is simply sublime! I showed this work at a felting show in Tucson last year, but had intended it to be a part of a triptych. 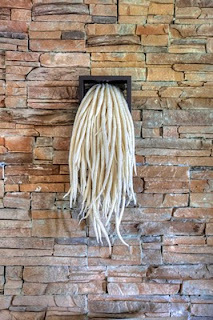 My hope is to create 2 more identical pieces and hang them vertically — but I dread having to make 200 more wool dreadlocks (okay, cheap pun). The title, The Fall, suggests waterfalls, hair pieces, and the fall of man (hah!). Kim Buchheit is a designer and artist with over 25 years experience. Her felting workshop schedule is posted below and more of her fine art textiles can be found here. Kim also operates her own exhibit and design business, which includes a custom prints and patterns service. 9 a.m.-noon and 1:15-4:15 p.m.
All felted designs are the works of artist Kim Buchheit and are copyright protected. Please respect copyright. Thank you.